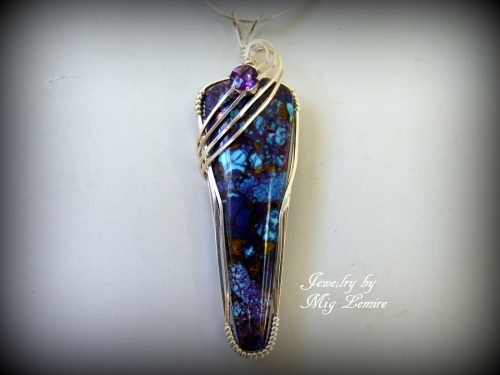 This high fashion Mohave Turquoise gemstone has rich blues and purples running through it and it is accented with a 3/4 carat faceted amethyst gemstone embedded in a sterling silver swoop. Very rich looking and dramatic. Piece measures 2 3/4" long from top of bail to bottom of gemstone and 3/4" at its widest part. Comes with a sterling silver snake chain.